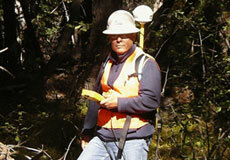 Armando Cuellar has worked for CCCI for seven years as a construction monitor, principal investigator, and surveyor. Mr. Cuellar prepares cultural resource surveys and investigations, coordinates with the California Office of Historic Preservation, conducts and supervises mitigation monitoring, and records archaeological resources. He has handled Native American consultations with federally and non-federally recognized tribes throughout California. Before coming to CCCI, Mr. Cuellar worked for over eight years on historic and prehistoric sites.